Torqbyte CM5 is equipped with an advanced safety feature not found on any other water-methanol pump controller. CM5 monitors the pump current on both of its output channels and is able to alert the user if the pump current drops below or rises above some user-programmable threshold. A fault condition where the pump current drops below a threshold could indicate the pump is out of water methanol fluid. A fault condition where the pump current climbs above a threshold could indicate a blocked water methanol injection line or even a seized pump (a common occurrence with externally mounted Aquatec DDP 5800 water methanol delivery pumps). So... what can be done with this feature? CM5's configuration software, TorqTune, allows the user to configure one of the unit's two General Purpose Outputs (GPOs) to either turn ON or turn OFF when a fault is detected on one of the pump outputs. Since these outputs are "pull-to-ground" types, when they turn ON they are connecting whatever goes there to vehicle's ground. When a fault is detected on one of the two pump outputs, the CM5's front panel FAULT LED flashes on and off, but that is rarely useful since in most installations, the unit it hidden from driver's view. At the most basic level, a LED or a buzzer could be connected to the particular GPO to alert the driver that a fault has been detected so that he/she may take appropriate action. However, the reaction time delay associated with having a human in the loop may be way too long to avoid serious problems in a possible scenario where the system runs out of water methanol fluid under high-boost. If the CM5 itself is configured to perform electronic PID boost control, it will automatically dump all the boost pressure when a pump fault is detected. But what it the CM5 is not used for boost control? What can be done in set-ups where a separate Electronic Boost Controller (EBC) is used? The solution is fairly straightforward. In this blog post we will consider how to use Torqbyte CM5's advanced safety features with a popular e-Boost2 EBC manufactured by Turbosmart. The approach described here can be used with other EBCs that allow their main boost setting to be overridden (or zeroed) by grounding one of its inputs. e-Boost2 has two optional wires, Green and Orange that can be used to activate up to 4 different boost set points. By default these wires are not connected to anything (i.e. they are left floating) so the e-Boost2 just uses its boost Set Point 1. However, if the user grounds (i.e. connects to a vehicle ground) the Green wire, e-Boost2 will start using its boost Set Point 2, or if he/she connects the Orange wire to ground, e-Boost2 will start using its boost Set Point 3. Table below shows what boost Set Point, the e-Boost2 will use based on that the user does with the Green and Orange wires. Obviously, when a water methanol pump fault is detected, the best course of action would be to immediately dump all the boost pressure to protect the engine. To achieve this, what needs to be done is to set the e-Boost2's Boost Set Point 2 or Set Point 3 to 0PSI and connect either the Green or the Orange wire to CM5's GPO1 or GPO2, depending on what else the other GPO may be used for. 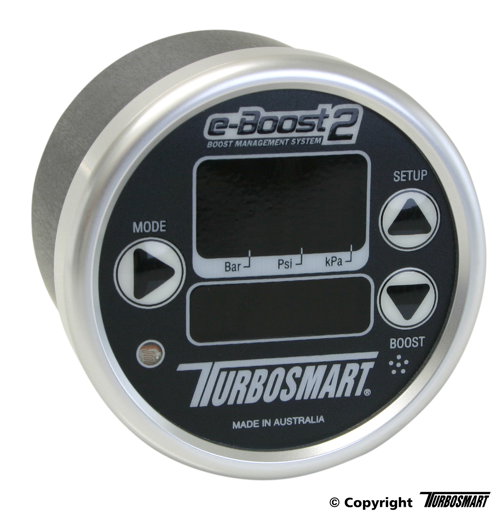 In this example, we are assuming that that e-Boost2's Boost Set Point 2 has been set to 0PSI and that the CM5 has been configured in TorqTune to turn on its GPO2 output when a fault is detected on its MAIN Pump Output. All that is required then is to splice together the Green Wire on the e-Boost2 to the Green Wire in Position 18 on the CM5's Input/Ouptut connector, which is its GPO2 output.